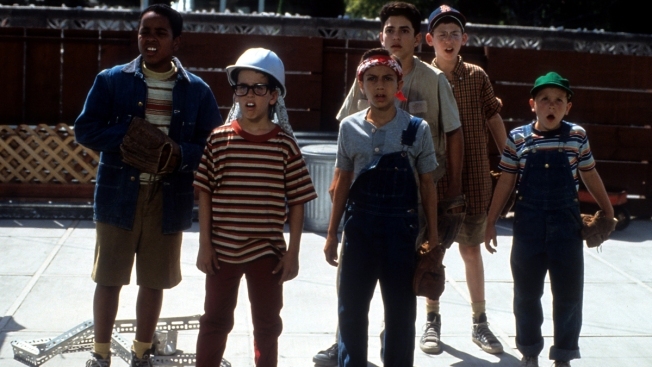 The gang of kids in a scene from the film 'The Sandlot', 1993. Fans of "The Sandlot" rejoice! The coming-of-age movie that all baseball-loving kids can relate to is coming to TV with the original cast members. Writer-director David Mickey Evans said on The Rain Delay podcast that the TV series, which will run on an unnamed streaming service, will bring back Smalls, Ham, Yeah-Yeah and the gang ... but this time as adults in the 1980s. "I just sold a 'Sandlot' television show. We're about to get an order for the first two seasons," he told "The Rain Delay" host Cooperstown Kurt. "I already got all the original cast members back. It takes place in 1984, when they’re all like 33 years old and they all have children of their own, and that's all I can tell you." The original 1993 film, set in the San Fernando Valley in 1962, gained a cult following due to its spot-on depiction of childhood, summertime adventures and of course, the love of baseball. The 2005 sequel, which was direct-to-DVD, featured a different cast including James Earl Jones and Greg Germann. Last year, the cast reunited on TODAY to talk about what life has been like since the movie. "I mean, it definitely gets you in places for free," said actor Alan McClennan. "I can't walk through a Las Vegas casino without someone yelling 'Yeah-Yeah!'" Devotees of the film got a special treat when it was re-released on the big screen for the 25th anniversary last summer. The original cast reunited in June to celebrate the original film's milestone by taking to the field at Dodger's Stadium before a game wearing Dodger's jerseys emblazoned with their character names. As if all this wasn't great enough news, a prequel to the hit film is currently in development. There's certainly a lot to look forward to from these old friends. After all, "legends never die!"